We begin, today, reflecting upon an introduction to Diary of Divine Mercy of Saint Faustina. This treasure reveals Jesus’ own Heart. It reveals His infinite love and Mercy. Ponder each short daily reflection throughout the day so that, by the end of the Year, you will have pondered everything Jesus revealed to this great saint. In the pages to follow, you will discover many of the beautiful truths of God’s Mercy. Some may strike you to the heart, while others may not. Pay attention, especially, to those reflections that jump out at you. Some may be deeply convicting and be the cause for you to reexamine your life. Do not be afraid to let the Lord speak to you in a powerful way and do not resist His message of Mercy. If a particular message does strike you, and if this is the result of God speaking to you and challenging you, then listen. Pray over that reflection and let the Lord speak. Do not be offended and do not turn away. This first chapter presents a basic introduction and overview of Saint Faustina’s Diary and the message of Divine Mercy in general. These first ten reflections are offered as a way of introducing you, by way of an overview, to the Heart of our Lord as revealed through the six notebooks Saint Faustina filled with her inspirations and private revelations. As you read through this initial chapter, allow yourself to be open to the newness of the concept of Divine Mercy and the devotion that flows from it. God deeply desires to pour out His Mercy in our day and age and the revelations given to Saint Faustina are a gift by which God is speaking to us in a special way. When speaking of Divine Mercy we refer to this gift from God as “The Divine Mercy.” By pondering “The” Divine Mercy we are more aware of two things: First, The Divine Mercy of God is real, definite and concrete. It is not some abstract concept but it is a reality that we must understand and enter into. Second, there is only One Divine Mercy. It is “The” one and only gift of God. All that God has given us is a gift and for this gift we are to be eternally grateful. Strive, today, to make this a glorious year of reflection on The Divine Mercy of God. Make a conscious decision to enter into all God desires for you this year. Lord, Help me to be attentive to The Divine Mercy You pour forth day and night. Help me, during this year of reflection upon Your Mercy, to allow it to transform my life in a real and profound way. Jesus, I trust in You. In preparation for a deeper understanding of The Divine Mercy, we begin with the first gift of God: The Creation of the World. God, in His goodness, created the world out of nothing. This act of creating everything out of nothing reveals, in part, that creation is a pure gift from the goodness of God. This first act of love is His first act of Mercy. Ponder the gift of creation throughout this day. Try and let your heart be filled with gratitude for all God created out of nothing. All creation reflects the splendor and beauty of our God. Lord, I thank You for the wonderful gift of creation. I thank You for creating all things out of love and for being the one and only source of all that is. All of creation reveals Your merciful love. Jesus, I trust in You. In addition to the creation of the material world, God created the spiritual world out of nothing. The angels, as well as every human soul, are gifts of pure love from God. In creating the spiritual world, God created beings who are capable of knowledge and love. The creation of angels is a particular act of Mercy toward humanity in that angels are created not only to know and love God, but also to know and love humanity and to draw humanity into the heights of Heaven. Spend time today reflecting upon the gift of all celestial beings. Our guardian angels, as well as all celestial beings, are precious gifts beyond our imagination. Try to let this reality sink in this day and be grateful for their working in your spiritual soul. Lord, I thank You for the gift of the celestial hosts of Heaven. I thank You for the abundance of Mercy You bestow upon humanity through these celestial beings. May I always be open to Your grace which comes to me through them. Jesus, I trust in You. When the eternal Son of God took on flesh in the womb of the Blessed Virgin Mary, human nature was changed forever. By uniting Himself with humanity, God raised our dignity to a whole new level. The Incarnation established a new unity between God and man and this is an act of the utmost Mercy on God’s part. Ponder, today, the great miracle of new life. Think of the birth of a small child. And then try to imagine this little and helpless child being the Creator of the Universe and the Savior of the World. What a gift of God’s Mercy! Lord, I thank You with profound gratitude for uniting Your divine soul with fallen humanity. I thank You for uniting Yourself with me, a sinner. May I always be in awe of the Mercy bestowed upon me through Your Incarnation. Jesus, I trust in You. The Incarnation was the greatest act of Mercy ever known. The only subsequent act that surpassed it was the act of Jesus dying on the Cross destroying sin and death by His blood. The redemption of the world, through the blood of the Cross, is an act of love and Mercy that we will never fully comprehend. We could never be grateful enough for this act since we will never fully fathom the depth of this love. Spend time throughout this day pondering the crucifix. Hold it in your hand, look at it, imagine it and meditate on it. And then try and close your eyes from time to time pondering the full reality of the Crucifixion. This was not an easy sacrifice. It was especially difficult to receive such brutality and to say, “Father, forgive them, they know not what they do.” This is Divine Mercy. Lord, help me to gaze deeply upon Your Cross and to discover, within that Cross, an ocean of pure Mercy. Wash me in this sacrificial love and help me to obtain eternal redemption. Jesus, I trust in You. The Diary of Saint Faustina calls us to a new form of devotion in various ways. The first way is through meditation on the sacred image of The Divine Mercy. Saint Faustina was asked by Jesus to have an image of His merciful love painted for all to see. It’s an image of Jesus with two rays shining forth from His Heart. The first ray is blue indicating the font of Mercy coming forth through Baptism and the second ray is red indicating the font of Mercy poured forth through the Blood of the Holy Eucharist. During this year discover this image, place it in your home and ponder its meaning. Ponder, today, the image of The Divine Mercy. Ponder, especially, the fact that no image will even come close to expressing the full depth of love pouring forth from the Heart of our Saviour. Grow in a desire for that Mercy as you ponder this sacred image. Lord, You have poured out upon the world Your infinite Mercy coming forth from Your divine Heart. May I bask in that Mercy now and always. Jesus, I trust in You. The Diary of Saint Faustina calls us to a new form of devotion in various ways. The second way is through the celebration of Divine Mercy Sunday. Jesus told Saint Faustina that He desired an annual solemn Feast of Mercy. This Solemnity of Divine Mercy was established as a universal celebration on the Eighth day of the Octave of Easter. On that day the floodgates of Mercy are opened and many souls are made holy. Plan on making this solemn feast a day of great celebration this coming year. Begin, today, looking forward to this culminating Feast of Mercy! Reflect upon the fact that the mere institution of such a solemn feast is a powerful sign of the desire in the Heart of God to pour down His Mercy upon us. Lord, may I always honor and celebrate the wonderful Feast of Mercy. May my heart, and the hearts of all Your faithful children, be open to all that You wish to bestow upon us through this feast. Jesus, I trust in You. The Diary of Saint Faustina calls us to a new form of devotion in various ways. The third way is through the Chaplet of Divine Mercy. The chaplet is a treasured gift. It’s a gift that we should seek to pray each and every day. Discover this wonderful chaplet of grace and Mercy and pray it often. Repeat its prayer over and over and allow yourself to receive all the grace God wishes to bestow upon you through this gift. 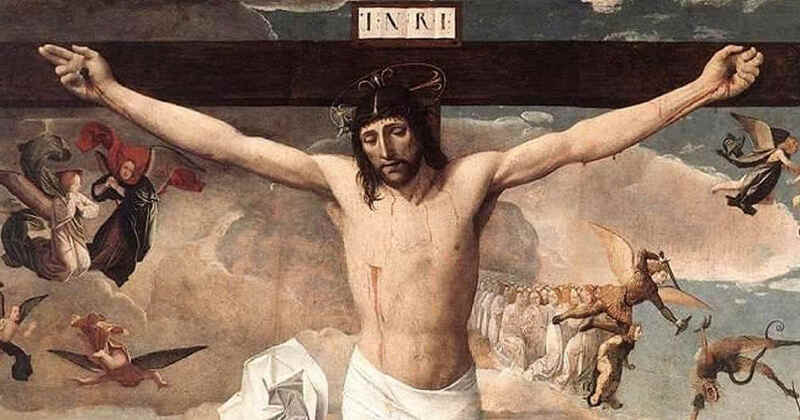 Eternal Father, I offer Thee the Body and Blood, Soul and Divinity of Your dearly beloved Son, our Lord Jesus Christ, in atonement for our sins and those of the whole world. For the sake of His sorrowful Passion, have Mercy on us and on the whole world. Jesus, I trust in You. The Diary of Saint Faustina calls us to a new form of devotion in various ways. The fourth way is by honoring the hour of Jesus’ death every day. It was at 3 o’clock that Jesus took His last breath and died upon the Cross. It was Friday. For this reason, Friday should always be seen as a special day to honor His Passion and ultimate Sacrifice. But since it took place at 3 o’clock, it is also important to honor that hour each and every day. This is the ideal time to pray the Chaplet of Divine Mercy. If the chaplet is not possible, it’s at least important to pause and give thanks to our Lord every day at that time. Lord, thank You for the gift of Your ultimate Sacrifice on the Cross. Thank You for surrendering Your life into the Father’s hands in this total gift of Yourself. May I always honor that moment of the day and daily strive to imitate this perfect Sacrifice of love. Jesus, I trust in You. The Diary of Saint Faustina calls us to a new form of devotion in various ways. In addition to our personal devotion, we are called to be apostles of Mercy. Are you an apostle of Mercy? The Apostolic Movement of The Divine Mercy is a call from our Lord to actively engage in the work of spreading His Divine Mercy. This is done by spreading the message and by living Mercy toward others. This is no small task. To live Mercy and to spread it requires a total union with the Heart of Christ. It requires a deep purification of our souls from all that is contrary to the love and Mercy of Christ. Ponder, today, how well you are as such an apostle of our Lord. You will most certainly be made aware of areas where you need to grow in Mercy so that you can better bring that Mercy to those around you. Stretch yourself and commit to being a better sign of the Heart of Christ in our world. Lord, I know I am called to be an apostle of Your most holy Mercy. I often fail in being a witness to this Mercy in both my words and deeds. Renew within my soul a longing to spread this precious gift to all. Jesus, I trust in You.